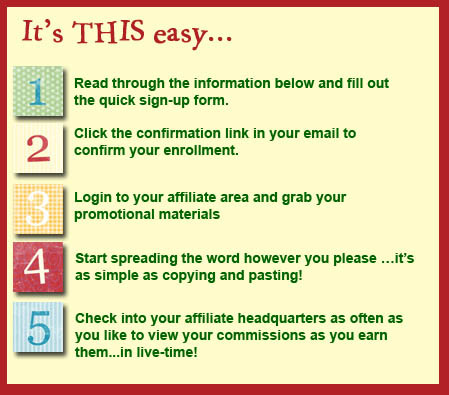 Earn Money as an Artella Affiliate! Looking for ways to earn some extra money this year? It’s completely free, and in minutes, you could actually start earning income simply for spreading the word about Artella. Then in your own Affiliate Headquarters, you can look at the clicks and sales and commissions you have received updated LIVE in real-time! We know that you – the wonderful creative folks in the Artella community – are the very best promoters and advocates that we could ever ask for. So the Artella Affiliate Program invites you to partner with us, in whatever way is easiest for you and get very generously compensated for each sale you bring our way. With the Artella Affiliate Program, you earn a 25% commission on every sale for Artella eProducts that you refer! Compare that to the all the other major programs where commissions are most often 7-10%, and you can see that your Artella commissions are 2-3 times what others offer online. That includes all Artella workshops, all e-courses, all eBooks, all video and audio recordings, and our entire selection of downloadable art supplies – literally hundreds of diverse products for creative individuals to choose from. When you register for our program (it’s free! ), you’ll get your own unique affiliate link that you can use to promote Artella. This affiliate link tracks every single referral that you make to our site, so when someone that you referred buys from us, you'll automatically get credited with the commission! 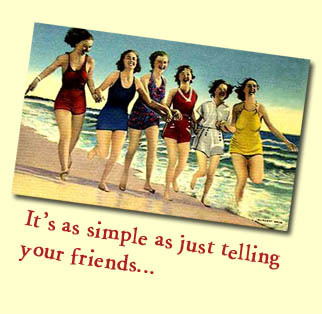 For example, you tell your friend about Artella and she clicks on your unique affiliate link. She likes everything but she doesn’t buy until a few weeks or a few months later. With most other affiliate programs, your customer has to buy within 7-30 days for you to receive a commission on her purchase, but with Artella, if she buys from us anytime within the next 6 months!, our affiliate program tracks this and gives YOU credit for the sale and you get paid your 25% commission. We even have state-of-the-art matching technology that identifies someone as your referral even if they delete their browser cookies from their system, a major drawback with most other affiliate programs! We are looking for partners for the long run, and the only way to do that is work hard on our end to make sure our affiliates are properly and generously credited. Our logic is simple: the more you receive in Artella commissions, the more incentive you have to continue to keep spreading the word about Artella. 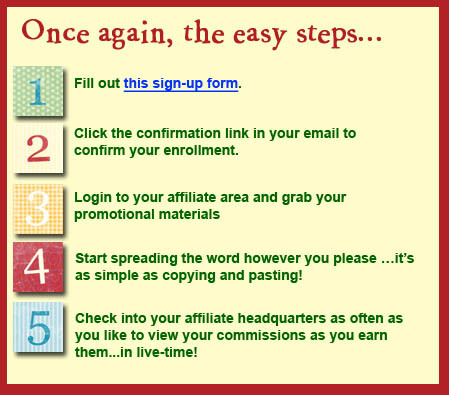 It only takes minutes to sign up, it’s completely free, and best of all, we give you everything you need to start receiving commissions, whether you have a blog, Web site, or even if you only have email or word-of-mouth offline. That’s right – you don’t even have to have a Web site to partner with us. All you need is enthusiasm for Artella Land, and the desire to spread the word and within minutes you can: sign up, send out an email or post something on your blog or Web site, and instantly start tracking your clicks and sales. For example, one of our wild and crazy dreams was to create an affiliate program where Artella affiliates didn’t have to sell…they just had to be generous and give stuff away, in the Artella spirit. We were so committed to this dream that one of the features of our program is a collection of actual Artella products that are for sale in the Artella store that we give to our affiliates for you to share with anyone….for free! So all you have to do is select one of the actual Artella products in your Affiliate Promo Package and send your friends a link where they can download the e-book or e-course, completely free. That’s it. From that point on, Artella’s servers will identify that person as your referral and you receive 25% commission on the purchases they make from Artella! What’s more, if you refer someone else to sign up to be an affiliate as well, they make 25% on any sales they refer, and you earn an additional 15% of all the sales revenue they bring in, just for having referred them! For some, this little ‘extra’ can actually be more lucrative than sales you get from people you refer. Why? For those of you who know others who have their own blogs, sites, or network of contacts, simply by contacting them and inviting them to become an affiliate, you receive your additional 15% on all the sales they bring in. So making 25% on your own sales is excellent, but making 15% on the sales of 20 or 30 others can be incredible, especially since you don’t have to do anything to get those sales. Your affiliates do their part to feature Artella and receive their 25%, you get your 15%, and Artella is responsible for handling 100% of all the purchases and customer support. Another feature that separates Artella’s affiliate program from the rest is that unlike virtually all other affiliate programs, we’re even happy for you to earn commissions on Artella purchases you make yourself! We don’t think you’re trying to “beat the system”…we think it’s a sound, honest way for you to try out different products from Artella at a big discount, so that you can share your opinions on them more personally and passionately. It’s a win for everyone. 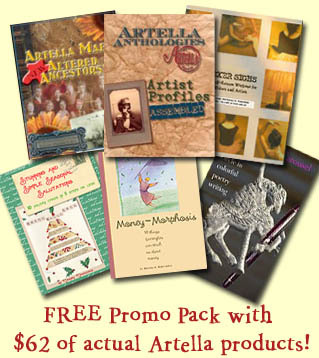 Register by July 1, 2015 and Get the Free Artella Affiliate Promo Package! When you register by July 1, 2015, you'll get immediate access to our exclusive affiliate members area, where you can access your special Artella Affiliate Promo Package with $62 worth of actual Artella eProducts for sale in our store right now. This package contains a variety of special promotional tools, including $62 worth of Artella eProduct Giveaways…all of which are programmed to track your unique affiliate link! You can enjoy these products yourself, distribute them as gifts, give them to your friends, or hand them out to visitors on your blog or Web site. With tools like these, you don’t even have to do any selling! You’re just sharing inspiring creative stuff from Artella, and earning money for doing it. One of our goals was to make our program fun and creative for you to use. That’s why the Artella Affiliate Promo Package – which is yours FREE when you sign up by July 1, 2015 - is full of fun, creative tools that you can use to promote Artella. From banners that you can put on your Web site, to text links you can paste in an email, to high-quality articles that you can post in your blog, to free copies of creative eBooks…and all of these automatically link back to Artella using your customized affiliate link. You don’t have to do anything technical at all…just copy and paste, following our easy instructions in the Artella Affiliate Headquarters. Plus, our high-tech tools tell you exactly what’s working for you! You’ll be able to instantly track exactly how the different promotional tools that you’re using are performing. BEST OF ALL, Your statistics are updated immediately, in live time, so you can see exactly which tools are working best for you! You can even see your statistics in animated Flash charts! It truly only takes minutes to sign up. We are sensitive to Web sites or programs with “get rich quick” promises, so we want to be clear that you will probably not make oh, a million dollars in a month and retire on a tropical island. BUT you CAN make a great deal of money just for spreading the word about an inspiring and creative company you can believe in. For some, it will be a great way to earn a lot of spending money on the side for very little work, for others, it will be a great way to bring in real income every month. Becoming and remaining an affiliate is completely free, and you get a lot of great Artella products just for trying it out and becoming part of Artella’s fun team! Questions? Feel free to contact us, here. © 2008 JROX Technologies, Inc. - All Rights Reserved.